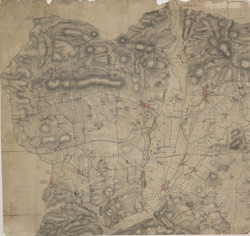 Although it was not until 1816 that recording archaeological sites became obligatory, the draughtsman of this map has indicated an iron-age hillfort, Cadbury Castle, near the town of Cadbury. It is depicted by a rough ring at the summit of a hill. Inclines in general are indicated by dense brushwork. The River Ex is shown in green. Its left bank is drawn with a reinforced line to denote a river that was particularly wide or tidal.